Each lens in the M Series suite of lenses includes a true Intelligent Lens System (ILS)™. The ILS automatically recognizes and calibrates a lens when it is installed. Stepper motor based encoding ensures that motor drift does not occur, as typically found with DC encoded motors, providing accurate and repeatable recall of all lens offset, zoom and focus positions. When used with Christie M Series HD/WU products, this ILS zoom lens has a 1.8-2.6:1 throw ratio. 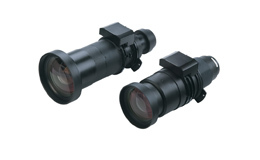 If used with any Christie M Series SXGA+ products, the ILS zoom lens will provide a 2.0-2.8:1 throw ratio. Please refer to the Christie Lens Calculator on this website or the downloadable PDF throw distance chart located in the resource tab of this lens option or the resource tab of Christie projector to be used with this lens.